With only one week left before my second marathon in two months it’s safe to say the my muscles are beyond tired of the pain from months of foam rolling post long runs. While there’s plenty of research over the benefits (it increases blood circulation to any areas that might be swollen or obtained small tears while running/cycling etc.) it is just so painful and totally awkward to do. 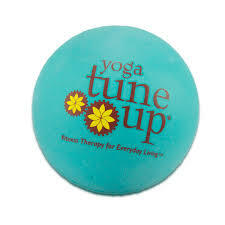 Enter my new favourite recovery tool, The Yoga Tune Up® Therapy Ball System! I was first introduced to The Yoga Tune Up® Therapy Ball System during a class at FlipSwitch studio here in Toronto, I have since then, motivated by my sprained ankle, taken two workshops. The Yoga Tune Up® Therapy Ball System provides targeted self-massage trigger point therapy by using specially designed high grip rubber balls that help penetrate through layers of skin and muscle to massage deeply into high tension areas. 1. Their Size! Because of their small size they are much easier to use and conveniently roll in many more areas of the body. With my sprained ankle I have really valued being able to use them on the arches and balls of my feet. 2. They are cheap! Only $15 online for a pair. 3. The FREE instructional videos. The The Yoga Tune Up® Therapy Ball System comes with many free “quick fix” videos which you can access online. You can also purchase full workout DVDs for either the upper body or lower body (runners/cyclists, I suggest the lower body as a great place to start). The website also allows you to search workshops and trainings within your area. Many are for the United States, however De La Sol in Hamilton (where I attended my first workshop) often hosts them. As an endurance athlete I highly suggest you check out The Yoga Tune Up® Therapy Ball System for post workout self massage and maintenance to keep you pain and injury free and performing your best.